Frontispiece: In traditional Japanese garb, Leonardo sits beneath a gargoyle, overlooking a city. He considers how all the major cities of America look the same and that deep down, nobody in them cares about anything. Or do they? At the farmhouse, the Turtles are lazying around the living room, watching TV and reading the paper. Both forms of media discuss a mysterious vigilante in nearby Springfield, providing anonymous tips to the police and breaking into seventh story windows for no discernable reason. This gives the Turtles the idea to get out of the house and pay a visit to Springfield, as they’d been missing big city life. After a few hours of exploring the city after dark, the Turtles hear gunfire and head to investigate. Scaling a building, they’re greeted by a man clad head to toe in black and wearing a cape. He’s been shot, but assures them he’ll be fine; what really matters is that the Turtles follow the truck that just sped off. The Turtles are reluctant to help him until he shows them his police badge, then they agree to meet him under the Memorial Bridge at dawn with their findings. The Turtles catch up to the truck and follow it to B.F.R. Trucking. At dawn, they wait by the bridge, not sure if this masked vigilante will show. The vigilante manages to sneak up on them and gets the information he needs. Though he refuses to offer his name, he tells them to meet him under the bridge at nightfall once he checks up on some leads. That night, the vigilante waits beneath the bridge and the Turtles get the drop on him for a change. Now “even”, the vigilante agrees to spill all he knows. B.F.R. Trucking does transportation work for a company called Ruffington Arms. Ruffington handles big Government weapon contracts, but the vigilante suspects they’re up to something. He tracked their shipments back to a waterfront salvage company and says they need to go there to find answers. At the salvage warehouse, the Turtles and the vigilante get a hold of one of the unmarked packages and find, surprise surprise, that it’s full of dangerous weapons. The vigilante says he wants to call this in to the police, only to discover that the buy is going down tonight and there’s no time to wait for the cops. Grabbing the missile launcher, the vigilante tells the Turtles to disrupt the buy and deal with the small fish while he keeps the head honchos from escaping. The Turtles take down everyone inside the warehouse while the vigilante follows the dealmakers. He’s unable to reach them before they board their escape chopper. 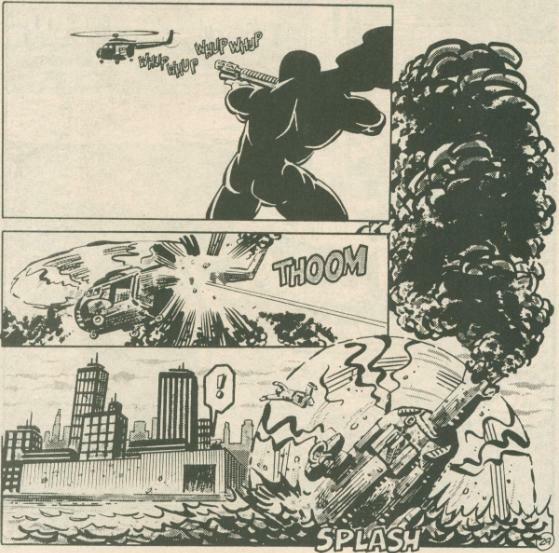 With no other alternative, the vigilante fires the missile launcher and blows the helicopter out of the sky. Later, the Turtles overlook the police clean-up effort, as all the goons they downed are arrested. The cops deduce that Ruffington was selling their excess weapons to the highest bidder and there’s enough evidence to make this an open and shut case. Leonardo ponders what became of the vigilante after the explosion, dubbing him “Nobody” because he never gave them his name. As the Turtles head home, Nobody lurks in the shadows and quietly thanks them for their help. *This story takes place during the period when the Turtles were exiled to Northampton by the Foot. Personally, I place it after TMNT (Vol. 1) #17. *The Turtles will encounter Nobody again in the untitled Nobody story included in the 1989 Tales of the TMNT (Vol. 1) trade paperback collection. *This story was adapted for the 4Kids animated series as the episode “Nobody’s Fool”. *This issue also contained a bonus pin-up page by Steve Lavigne. There are a lot of recurring superhero characters in the Mirage TMNT universe. You’ve got Radical and the Justice Force, but of them all, Nobody is the only “superhero” in the comic I’ve ever actually liked. It probably has to do with his being a bargain bin Batman and I think that sort of “superhero” archetype works better with the Turtles than the more outrageously overpowered variety. 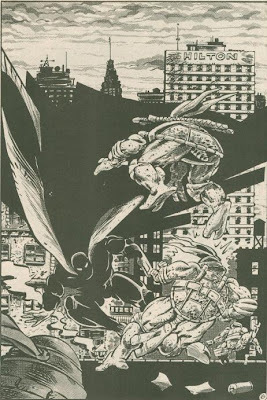 I’d rather see the Turtles running along rooftops with a discount Dark Knight than trying to keep up with the Superman-like characters such as Radical or Vanguard. It seems a bit more within their element. For a first appearance, though, it might be a wonder just what there is to like about Nobody. He doesn’t really do a whole heck of a lot in this story beside get shot, make the Turtles agree to meet him under a bridge twice then blow a helicopter up with a missile launcher. He doesn’t fight anyone and he doesn’t display any combat skill beside the (albeit impressive) ability to sneak up on the Turtles. He’s a character that would definitely come to shine in later appearances, particularly as a major player in the “Shades of Grey” two-parter, where his exploding the helicopter and killing its passengers would be an important plot point. So far as this issue goes, he’s kind of lame. I wouldn’t say the story’s paced particularly well, either. The Turtles bump into Nobody on a roof and he immediately enlists their aid in tracking the truck despite not knowing who they are or what they’re capable of (or even being concerned with their being giant turtles, for that matter); it’s very rushed and awkward. They make a big deal later in the issue about earning each other’s trust to try and make up for that weird, hurried introduction, but all it amounts to is a lot of talking. Nobody having them meet him twice under the bridge in the span of 3 pages is especially bad pacing and I’m pretty sure they could have streamlined the script into a single bridge-gathering with ease. Jim Lawson’s art is very good and rapidly improving in certain fundamental qualities. 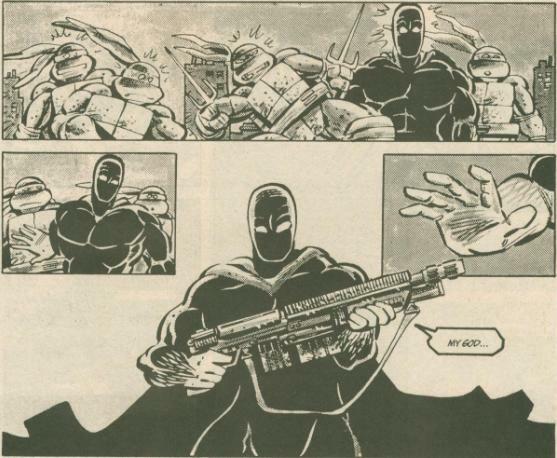 By the next issue of Tales of the TMNT a lot of his problems with scale and foreshortening won’t exist anymore. In this issue, though, there are some moments of awkward character staging in the layouts, such as page 1, where the Turtle in the hat (no telling which one it is) is just standing in the corner like a mannequin, or this really goofy-looking panel on page 3 where one of the Turtles is holding up their finger with an “I have an idea” statement while the other two Turtles smile at the audience like we’re taking their picture. 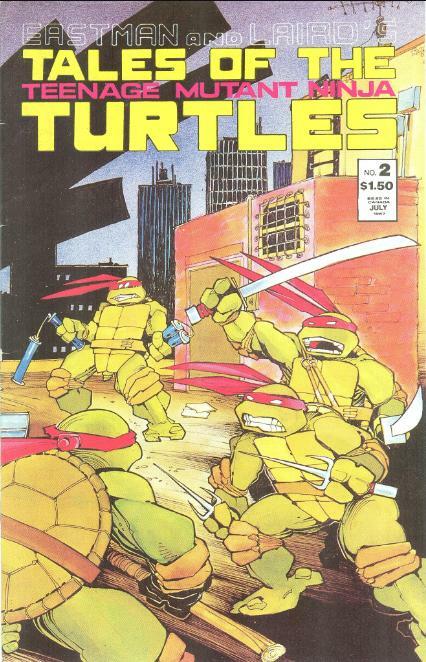 The Springfield cityscape on page 4 looks like a backdrop in a stage play, the way the Turtles are standing before it. But while, yeah, there are some pages like that, Lawson’s work shines over those shortcomings elsewhere. 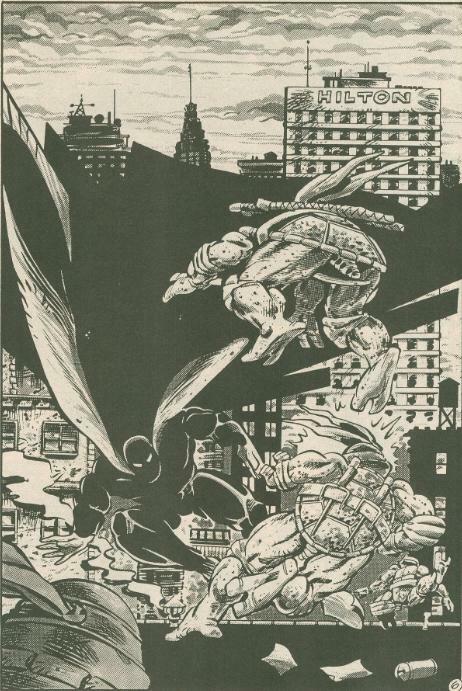 The splash page on page 6 where the Turtles encounter Nobody is beautiful, particularly down to Ryan Brown’s inking, and I absolutely love the layout on page 5; how the panels are made to look like the different stories of the building the Turtles are scaling in the outer frame. When you get down to it, Nobody is a good character with a rather poor introduction. I think this is another one of those stories the 4Kids cartoon got to handle a bit better thanks to decompressing it and allowing Nobody to have a stronger hand in the action.